COCKTAIL MEATBALLS are the best holiday appetizer! These sweet and spicy Cranberry Meatballs are cooked in a cranberry pepper jelly sauce, which gives them the perfect kick of flavor. 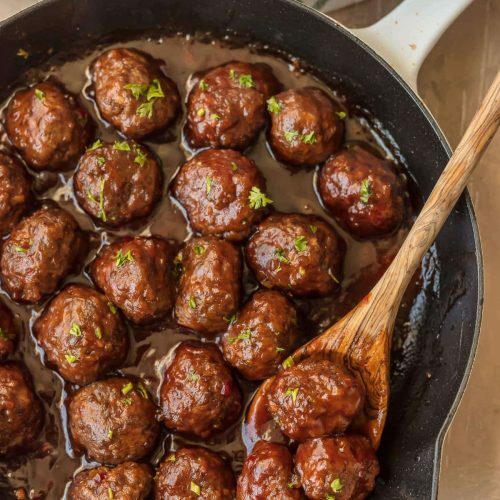 These cranberry sauce meatballs are just so delicious! The best Thanksgiving, Christmas, or New Years Eve appetizer without a doubt. 2 tablespoons minced onion opt. In a large bowl, combine ground chuck, breadcrumbs, eggs, chili sauce, Worcestershire Sauce, onion and salt. Mix until all ingredients are incorporated but do not overwork the mixture or the meatballs will be tough. Form into 1½ inch meatballs and place on the prepared baking sheet. Leave at least 1-inch space between meatballs. Cook at 350F for 10 minutes then turn each meatball over. Cook another 10-15 minutes or until meatballs are cooked through. Remove from oven. *While meatballs are cooking, prepare the sauce. In a large skillet over LOW heat, combine all sauce ingredients. Stir until well blended then remove from heat until the meatballs are ready. When meatballs are cooked, place them in the sauce in the skillet and simmer for 1-hour or until sauce has thickened. *The meatballs and sauce can simmer on HIGH in a slow-cooker for the last hour.